As a normal 25 year old female I am overcome more or less daily by my insecurities, but I mean.... we could have a whole other post about that... today I just want chat about a few particular products that make me feel better about myself. 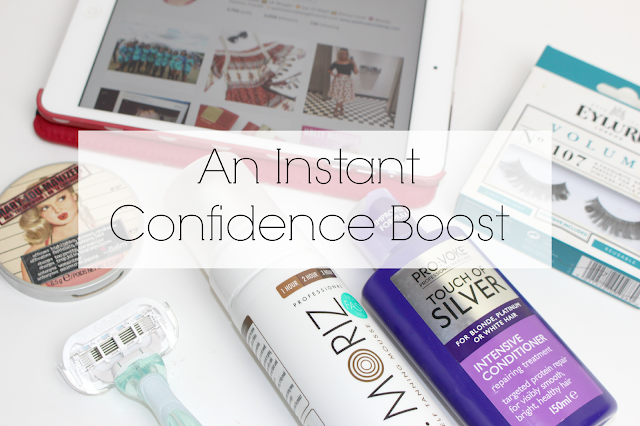 Easy peasy instant confidence boosters... because who isn't interested in those?! Yes, there are a few things out there that in my mind 'up' my glam game and give me that confidence that I'm otherwise lacking. I can't actually remember the last time I went on a 'night out' without a pair of fake eyelashes on. I think I've been wearing them ever since I went to Ibiza in 2009. For me, these are a MUST when heading out the door on a girls night out, I have THE shortest, stumpiest lashes and really small eyes so without them I don't ever feel like my make-up is finished or anywhere near as good as it could be. Favourites : Eylure Eylure Eylure- I love 101's and 107's ALOT and I do struggle to use other brands I'm not going to lie! I really want to try out Fleur De Force's new range aswell - maybe even the individual ones as I've heard they can stay on all weekend which would be amazing for Festivals and trips away! The world (and my face) would be a sad sad place without a good highlighter! I think I have a slight obsession, I don't think I will ever own enough. Ever since buying the makebelieve skin lmizer as a teen I have be striving to find products that give me that dewy glow that all the celebs rock with ease! Favourites : theBalm Mary-Lou Manizer, Seventeen Skin Wow!, Rimmel London Good To Glow, Benefit High Beam & Victoria's Secret Illuminating Powder. Not only do these products stop me from looking like a pale whale they also help to tone the look of the skin - a good tan can make you look a whole lot skinnier you know, I just wish I had more time (and patience) to use it more! Favourites : Anything St. Moriz. What feels better than freshly smooth legs? 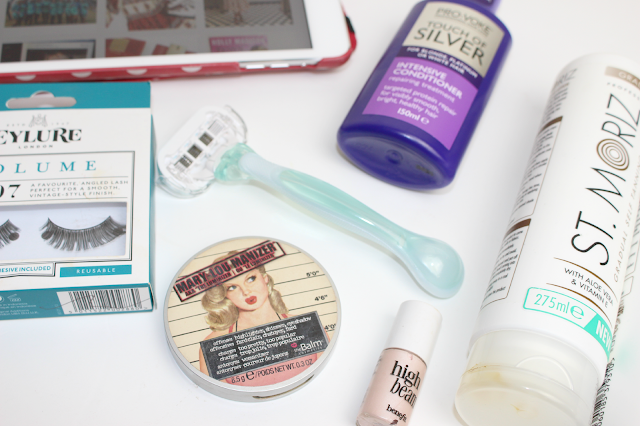 Seriously though - smooth, soft legs are the best - a major confidence boost in just a few swipes! Yes I'm saying it and you may think it's obnoxious and vain but in all seriousness - a good filter and a bit of editing can make me feel better about myself and I know a lot of you girls feel the same.... so don't act like I'm being fake and self-centered haha - you all love a good selfie! Last but not least.... this is a big one for me when it comes to confidence. I am blonde, but I'm not a natural blonde, so I am always paranoid about what shade my hair colour is looking. My hairdresser is amazing and everytime I had my hair coloured I fall in love but after about 6/8 weeks I can see my colour fading and becoming dull - and sometimes even.... yellowish #booo! BUT there are products that can fix this and I have become a slave to them! Toning shampoos are totally and utterly fabulous and after getting over my initial fear of using them (I was paranoid I would have purple hair if I left it on for longer than about 45 seonds) I have realised how much they can help and if I feel like a pick me up this is one of the first products I reach for! Favourites : Pro:Voke Touch Of Silver Twice A Week Brightening Shampoo & Intensive Treatment Conditioner. What are your favourite confidence boosters? I literally relate to every single one of these! Thank god for false lashes and highlighter! Fake tan gives me so much confidence and a highlighter too! I love wearing fake tan (and yes I'm a sucker for St Moriz too) but I'm much too lazy to wear it for any other time than a night out, wish I had more patience for it! I'm so obsessed with (my own) instagram and my tumblr haha! And as a person who has like no eyelashes, having fake ones def make me feel so much more elegant! YES Smooth legs are the ultimate confidence boost! I'm dying my hair blonde soon so will definitely be needing toners! Fake tan is definitely a confidence booster for me! I find it makes such a huge difference! Ah love this, I totally love fake tanning and having a fresh blow dry to make me feel a little perkier along with a lovely bubble bath! Definitely on board with the false eyelashes thing, when my lashes look good I feel like I can conquer the world! YAASSS. Love this list so much. Completely agree with The Balm Mary-Lou Manizer-it's my newly favorite highlight! I neeeed the pro voke shampoo- getting some on my way home tonight! It's amazing that some little things that can just give you such a confidence boost eh? I agree with all your choices! I probably will never go anywhere (on a fancy night out/event) without my false lashes!! Tanning does magically make you feel more confident. I've just purchased the st moriz fake tan and I've not used it before so praying it'll be good!